This book is dedicated to all of those I have met in my life and who, regardless of their behavior, taught me valuable lessons. I will also add two special dedications. The first one is to the boys, my three sons who, each in his own way, have taught me much about life, and secondly, to two people whom I’ve only known online, and who have always believed in my work. These two individuals are, ladies first, Dr. Elsa Mendoza, a doctor who is a fighter, committed and wise, someone who I deeply respect. And a man, whose books have taught me a different way of seeing things and whose truth I have come to respect, Victor Roude. Before you start reading this book, there are two important things that must be defined. First, what does it mean to be a dumbass? The Macmillan Dictionary says it is a word used to describe “silly, idiotic, unintelligent” people. I believe these adjectives are more than enough to define what we mean here by dumbass. In essence, we’re talking about people who go through life being afraid of everything, not being able to deal with everyday issues in life, reacting in clumsy, silly ways, and who have a disorganized life and leave many things to chance. Basically, that’s what we mean by dumbass. I’m guessing this is what you no longer want to be. You no longer wish to be a dumbass. Once and for all, the time has come to bring about the changes that you need n your life to stop being a dumbass. This is the first point I wanted to make absolutely clear before you begin reading this book, what it means to be a dumbass. In countries like the UK, we may call a dumbass a wanker or a twit. This is precisely what I’m talking about. In life, you should stop being a dumbass, wanker or twit, and start learning what you need to change in order to live a different life and get out of a rut. 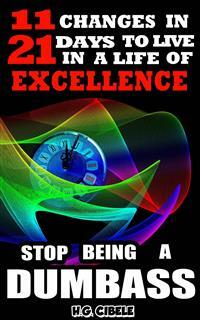 In this book, I describe 11 changes that you must make to live a life of excellence. It is possible that when you read each one you might think they are obvious, and that it’s something you already know. But that’s not what’s important. We all know things, but understanding and doing are completely different things. This is why I am going to guide you in these pages with small, simple techniques so that through actions, you’ll make the changes required to change your dumbass life into a life of excellence in every way. The 11 changes you need to make are not presented in the order they need to be made. All of the changes must be made simultaneously if you wish to obtain the results you dream of. But the first change, "Get Organized", occupies this position intentionally. It’s a change that you must understand from the beginning so that you know how to implement the other 10 changes. However, this does not mean that by only getting organized you will be able to live the life you want to live. How can I assure you that you will succeed in 21 days? When I say this, I mean that in 3 weeks, the changes you make will become new habits. Research shows that this is the time that is needed to create new habits in your life. Naturally, we’re talking about 21 days of daily practice to create a routine. After this time, you will have eliminated any resistance to the new habits, and this is precisely as it should be because these changes should become a part of your day to day life forever. But after this time, they will become things that you will need to do in order to feel good, coupled with the wonderful results that you will begin to see in your goals. What I propose in this book is nothing more than changing in a natural way. So, I will present 11 changes that you need to work on simultaneously, regardless of the order they are presented in. The third one is not more important than the first or the fifth or the sixth. You must simply must work on them at the same time for them to work. Well, I mentioned that the first change refers to getting organized in life. I know it sounds a little robotic, schematic and even boring, but this is not so. Organization is important. Don't forget that one of the characteristics of a dumbass is that it’s a person with a disorganized life. At the same time, you must start to learn different behaviors and ways of being to make everything work: learning to say no, making the appropriate changes to your attitude, learning not to judge, learning not to control, learning to focus, and avoiding what’s harmful, among others. Ultimately, we’re dealing with a series of learning outcomes that are important to living your life and doing so within a state of excellence. These are real changes that you can make, and I assure you that you will change your life. However, you must understand that you must sit, get organized, and start acting on them, or there will be no results whatsoever. In this book, I will give you no magic formulas or absolute guarantees. And the reason I’m not giving you a magic formula is because there's no magic involved. These changes are natural, and have been tried and tested. These are normal changes that many people have made throughout the world to change their lives and achieve success. And why am I not giving you a guarantee? Because it is very difficult to guarantee something will happen to someone I don't know. I don't know who you are. I don't know how much time, to be honest, you are going to dedicate to changing your life. What I can tell you is that if you manage to make these changes, you will live a life of excellence. But the guarantee that you will live a life of excellence will only depend on you. The zero (0) change you need to make is to decide and start acting to achieve the changes you want. Once you make all 11 changes, I guarantee you're going to have a very different life, a life where everything will fall into place in any area, whether it is money, work, love, family life or relationships with friends, and in anything you want. So it is a simple choice. Decide to make changes. Decide to make the world work for you as you want it to work. Stop sitting and waiting for things to happen and make them happen. Lastly, I believe it is important to clarify the concept of excellence. Something is excellent depending on the perception, understanding and knowledge of life that each person has. For this reason, I can’t tell you what is excellent for you; it wouldn’t make sense. Only you know what that is. What I might deem to be a life of excellence may be a poor and boring existence for you or vice versa. So, you know what you want and what you want to accomplish through these changes. This is what you must accomplish to live a life of excellence. And why do I say what you wish to achieve once the changes have been made? Because it is very likely that what you wish to achieve right now is not really what will make you happy and allow you to live a life of excellence. As you read this book, you will understand better what I mean by this. All right then, the door is wide open. You are still reading. I recommend that you do so in one sitting and then read one chapter at a time as you take notes on the keys to what you need to learn in order to achieve each change. When you reach the end of the book, you may implement these changes right away. If you do this from the heart and believing in yourself, you’ll be surprised at the wonderful things that will start to happen almost immediately. "I’ve already done what’s possible. I’m attempting the impossible. It’s a miracle I’m staying organized"
"Success is not achieved only with special qualities. It is primarily a work record, method and organization." Nothing in this world exists by chance, everything has an order and organization. For this reason, it makes sense that life is based on the same principle. It is basically impossible to achieve anything in this life if you don’t get organized first. One of the biggest mistakes made by man is to believe that it is enough to simply sit on an easy chair and think and plan ways to get your life in order. In my years of experience, I have learned that those who don’t get organized simply fail. For this reason, the first secret to success is organization. But, what is organization? It simply entails outlining and puting in order way what you want to achieve in life in any of its areas. First off, you may think that it is tedious and robotic to have everything organized. You might think that if you do this, your life will lose the charm of uncertainty and surprise, turning your life into a routine. And, I confess, that is true, or at least it’s what it seems to be at first. However, nothing could be further from the truth. The organization of what you want in your life, the planning of your goals and objectives with specific activities does not eliminate the element of surprise and adventure in the process. What’s even better, you'll still come across setbacks, you will get results that are not what you expected and sometimes you will fail, but your path will be clear, and your organization will allow you to course correct and not surrender to difficulties. And why does this happen? Because when you know where you are headed, you will never lose hope, and this will help you persist in achieving your goals. This is exactly where the secret to organization lies. The creation of an outline, puting it in order and setting priorities enables you to clearly see where you are headed, and this is the most powerful key. Most people want things in life but tend to not know with clarity what it is they want and how they want it. For years, I have encountered people like this, simply lost in their dreams without knowing which way to go. They want to have money, but they have never planned how to obtain it. They dream of a great love but have no idea what to do to find it. They want to feel better physically, but they have not bothered to find out what they need to do to get there. They are, simply out, perpetual wishers, who do not know what they want and how they want it.